Hopefully this page can answer some questions but as always, the best way to have your questions answered is to call eLaunchers directly at 301-760-3953 or request a free consultation. Our ideal client is a someone who makes money through appointments (ex. dentist, orthodontist, attorney, etc.) If you need to establish trust with your prospects (or who they are allowed to ask for money), that is a good client for me. Now within that industry, I want people with the right mindset, who understand the value of an automated lead generation, lead capture, and lead conversion theater. I also do very well with companies that are spending money on marketing but are unhappy with the results that they are generating. The process that we build puts measuring devices on your current marketing materials to help you determine what’s working and what’s not working. That way you can actually go in and figure out what you should do to turn on the heat, what you should tone down, or what you should turn off. A lot. And it’s a significant relationship. It takes more than money to do this. I won’t just be needing money, but I am also going to need you, I am going to need your time. I am going to need your attention, and this won’t be done overnight. This is not a machine, this is not a product, and I don’t have a coaching program. I am doing all the work. So, here is how the relationship starts. First thing we need to do is meet. I need you to come to Germantown, MD. We spend about a day and half together. We will meet in the afternoon. I will ask you a whole bunch of questions. I need a total of 14 hours of in-person time just for white- boarding, talking, and making decisions at a very detailed, tactical level. This is a retreat for your business, and it will make you tired. I had a situation when a couple arrived at the airport, and we went to my house for dinner. At 9:30pm, I just drove them to office to pick up my laptop, and I heard the lady scream, “Oh no, we are at the office again”. I don’t get tired. I work very hard. It could be a very long day and a half. It is fun for the most part. And the next day, we begin drawing. We build a mindmap of what can be done for your business. We do the SWOT analysis and draw it out; we then build a marketing automation plan, and we build an Infusionsoft perfect customer life cycle. We draw out what assets you already have in place that will yield to this marketing makeover, and we will put together the taskforce, the task list, task timeline, and budget. The fee for the initial consultation is $4,750. At the end of the consult, if you think that it wasn’t worth your money and time, I will not only return your money, but I will also reimburse you for your time and hotel expenses, and I will drive you to the airport myself. to get you money. I have a list of 486 tasks that we may perform for you. We will give you the list and say that these are the tasks that we intend to do for you, and we will do whatever you amd I feel is necessary. We may or may not do certain things. We might end up adding more things. You might not need one website, you might need three. You will also have a comprehensive list of the things that I don’t do. And for things that I can’t do, I will tell you who to contact to get them done. We do whatever it takes to make you win. All my services come with a 100 percent money-back guarantee. We do not guarantee success. I don’t always achieve success. In fact, you can expect that half the things I do will not generate a positive return on the money you invest. I am not guaranteeing success. I don’t have a silver bullet. I do guarantee that you will be happy. If I fail to please you, I will invite you to ask me for a refund. I am perfectly willing to write off my losses and move on rather than lose a friend, because another practitioner in your zip code will want to buy what we created for you. If I didn’t do a good job, I would rather lose money than lose faith. In addition to the marketing makeover, I also have a managed marketing services that serves as HMO for your entire marketing department. My tech team, my Infusionsoft team, my data team, my print production team, my web team, my project management team, my people in India, my people in California, my people in Germantown, and my interns all work for you. Everything I do is in your ecosystem. For example–your website is hosted on my server, until you want to host it somewhere else. It’s in your Infusionsoft, connected to your practice management system. It’s your API bridge that you are buying directly from DENTMA. You can terminate our relationship without having anything else to break. You tell me to leave, I begin packing, and as long as another competitive person is doing what I used to do, I will not take a mission critical piece of your life and leave. It can take between six weeks and six months. It depends on you. What do I have to do as the client? You will need to write, or you will work with a writer that you hire. You will need to approve the content. You will be approving the strategy. The most important thing is that this is your practice, and I need to capture your spirit and show it to the world as intended by you. I am creating your avatar in paper, pixel, and plastic. I can’t do that without you. So when I need you, I need you. I will be asking for your private email. I will ask for your cellphone number, and when I need you I will ask for an appointment. We also expect that you read what we give you and you give us feedback on time. If you don’t, we will nudge you. If you don’t respond to a nudge, we will nudge you aggressively. If you don’t respond to our aggressive nudge, we will wait for you and we will wait for your attention. Now we also expect you to be happy. This is not a black box. This is built to your taste, to your satisfaction. So if you don’t like something, we expect you to tell us, so we can fix it. You are not wasting our time. If I need to scrap something and start it over, I am going to do that. You don’t have to be reasonable, you have to be happy. your own copy, or if you are going to do something in Wordpress or Infusionsoft, we expect that you report that to our project manager. When I say you, it means your entire ecosystem (you may have other ad agencies, you may have staff members, you may have other vendors, etc.). We need to include the mass one cohesive force, one united front towards the common goal. But when you buy my system, by default you are putting me as an admin of your entire theater. My staff, you, your staff, your vendors, and their staff, will report to my project manager, my production manager, and my timeline. That’s what you have to do. Why should I work with eLaunchers? Well, at the end of the day, my process does four things: gets patients, keeps patients, sells treatments, and gets referrals. If I don’t do it, somebody else will have to do it, or it will not get done. The core purpose of implementing a marketing automation system is reducing dependency on humans and putting a system in place, which does its job day in and day out. Have you ever watched Spongebob Squarepants? He makes Krabby Patties. There is no system to it. There are no standards to it. There’s no process to it. That’s why Mr. Krabs only has one location. You want to do this because you are the doctor–you are the ringleader of the whole circus. Try taking a step back from it and seeing if your world can function without you. How are you going to retire? If you are working hard and unhappy with your income, and cannot work any harder, how are you going to grow? How are you going to do more than one location? What if you want to sell your practice? Who’s the buyer who wants to buy your practice? Can they walk into a systematized lean mean marketing machine that is generating a steady flow of leads? Lead generation is not as critical as lead conversion. Any ad agency, any decent marketing communications company, will have a capacity to generate the leads at the top of your funnel. you do not have your people, paper, pixel, and plastic tastefully organized, you will always be dependent on the skills of your people. I can program paper, I can program plastic, and I can program pixels. I cannot program people. People need to do what I tell them to do. If you had a choice, who would you rather depend on, paper, pixel, and plastic, or people? It is your call. We schedule a day, you get on a plane, you come over. Before that, you will want to FedEx me any or all marketing materials that you have. Also send me a list of the URLs that you own. Get me a list of all your people who are involved in your marketing lead generation, lead conversion, and any other humans that I should know about, and what role they play. I don’t want to step on anybody’s toes. Basically, usher me into your world before we meet. If you have done direct mail marketing before, you probably would have received some returned mail that was undeliverable. Send that mail to me. If you have very large pieces of mail, just peel off the yellow sticker that the post office puts on. I want to read your sticker. When I look at your returned direct mail, it gives me a certain amount of information about the health of your data and your list and stuff like that. It prepares me for our conversation when you come. I need a total of fourteen hours. You will be here for a two-night stay! If there’s anything else that you want to work on while you are here, bring it with you. I don’t do anything else except take care of you when you are on the floor. We call it client-on- the-floor. When we have client-on-the-floor, I willhave my complete attention towards you. Anything that you want goes into my mindmap. At the end of our discussion, I print those big mindmaps and give you copies to put on your wall and check things off as we get them done for you. How do I get an ROI on my investment? is how bad it will hurt if they have to write off the investment that they are making. I do not have a silver bullet, I do not have a magic pill. I can’t wave a magic wand. We will take steps to mitigate risks, we will use common sense as our guide, but your money is truly at risk. I am on the edge of my seat until we reach the first fiscal milestone. I want our relationship to be a zero-sum game. My first goal is to sell at least one treatment so that you are getting money in your hands out of our joint efforts. I am looking for that much money in the vicinity using a common sense test before I encourage someone to buy. If I am not comfortable, I will tell you that I am worried that it is not going to work. I cannot predict success, but I can predict failure with precision accuracy. If I tell you something is going to fail, take my word for it – it will not work. So call it a blessing, call it a curse, but I have a capacity to tell you if something is not going to work out. The second milestone I have is a three-times return. If I you are investing $3,000 with me, you need to generate $9,000 in revenue, because you are going to have an overhead, and you are going to have the cost of goods sold, and you are going to have an expectation of profit. So you are determining whether or not you want to continue working with me, whether or not you want to fire me, or whether you are happy or not. You need to keep two things in mind. At what point do you get all your money back? What is generating three times the cost of it, and what is generating under three times? Anything generating over three times, is a jackpot. We standardize it, we systemize it, and we keep doing that and we tell the rest of the tribe. For anything that is doing less than three times, we keep tweaking it until we reach that magic three times goal. of the pieces that I have built. That’s what I have to say on ROI. Who else have you done this for and what were their results? For dentists/orthodontists: I have had the privilege of doing data intelligence and dental marketing work for some of the top of the class in the Dan Kennedy world. I was invited to play with Dr. Tom Orent’s system, and with the mastermind members of Charlie Martin. People who attended an event hosted by Jerry Jones or hosted by WhiteHall have used our services. Of course private clients of Dr. Dustin Burleson use us, and the people who attend his events and buy his info products. I have had the privilege of not just learning from these guys but also working for them; they all have good things to say about me. I am proud to have a growing list of references who not only will cheerfully record a video for me, but routinely attend events where I am exhibiting, and spend two to three hours at my booth and tell people how they feel about working with me. Do I win all the time? No. With every day that goes by, I am evolving, I am getting better. We are getting better, we are becoming a better company. If we aren’t meant to be together, I will engineer my exit from you, in such a way that only I get hurt. I can always make money, if not from you then from somebody else. You can go to elaunchers.com/testimonial, watch some videos, and read some testimonials. Or their names are there with their picture. Pick up a phone and call them. As a matter of fact, if you become my client, someday I will ask you to be on this list. I will want you to talk to my prospects, I will want you to attend some events, come to my booth, and encourage others to become clients. I cannot grow my business without my endorsements. the same team that I am recommending to you. It’s an open game, and if something does not work, I don’t hide anything under the rug. We dissect the problem, learn from the mistake, and we move on or redeploy. Why do you have a monthly maintenance fee? Once your plane is built, where would you rather sit, in the cockpit or in the cabin where someone else is flying and you are minding your own business? Most people want to outsource the day-to-day maintenance of a complex marketing machine that has a lot of moving parts. If you have the skills to manage an in-house or outsourced marketing management team, you will not need our monthly maintenance program. Our process is not magical. It’s all common-sense-driven. I have an assembly line approach. I can do something in one hour that will take you four hours. I have teams in India, America, and in multiple locations that work as one cohesive force that allows me to day in and day out deploy your marketing management system. Imagine driving home from work, picking up the phone to call me, and saying, “Hey, I want to do campaign number 23 to list segment six in the next two weeks.”You and I know exactly what we are talking bout. That’s what you get for monthly maintenance. If you don’t see a value in it, or if you have someone else who can do the work that we do at the price we charge, we will cheerfully hand over the keys to your team. We will show them what we do, we will teach them how we do it, and we will be available as a backup if your team fumbles or needs. Or you might want to in-source everything internally, and have me as a consultant; then you can talk to me about what you want to do differently today. You have a lot of options. We don’t have a contract. The monthly maintenance is a month-to-month agreement. We bill on the fifth of every month. As long as you tell me on or before 30th of the month to stop charging you next month, then we will not charge you next month. We don’t do SEO, we don’t do social media integration, and we don’t do reputation management. These are highly skilled traits that are meant for highly trained professionals who are extremely good at them. I am privileged to be teamed up with a sister company that eats, sleeps, and breathes SEO, social media, and reputation management. They come with the same passion for marketing and a money-back guarantee like me. I will introduce you to their team, you will evaluate them, you will look at their rules of engagement, and you will make a decision, whether or not you want to engage with them. If you hire someone else for SEO or social media marketing, we will collaborate with your vendor. We will team up with them, we will give them the call capture mechanism and the landing pages, we will facilitate the A/B Split testing, and we will team up with whoever does this part of the work. Before you work with the team that we recommend to you, one thing you should know is that their team and our team are aware of each other’s strengths and weaknesses. I have the capacity to pick up the phone and mediate, if there is problem. Trust will never be an issue; if you can trust me, you can trust them. When we meet, I will make an introduction to you. What types of marketing do you NOT do? We do not do social media marketing, we do not do radio, we do not do television. We do not do public relations. We do not do space/print advertising. We do not do outdoor advertising, and we do not do vehicle wraps. What is your deal with Dan Kennedy? Dan Kennedy jokingly calls me his parasite. If he is speaking somewhere and if I am allowed, I would get inside the door and attend, will take detailed notes and prepare a mindmap. 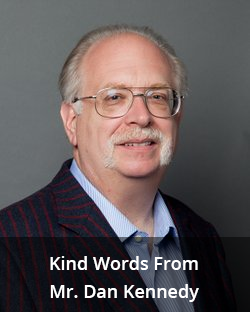 If you have listened to him, Dan Kennedy is 30 percent core instructions on what you should do, about 40 percent anecdotal evidences, and about 25 percent fun, and 5 percent picking on me, when I am in the audience. Without fail, that’s how it works. to 2014, I have over two dozen mindmaps with more than 3,000 direct instructions on what Dan Kennedy wants someone to do in their business. This is the raw material of my intelligence. are ever in the audience and Dan is speaking, you will listen, you will take notes, you will make circles, you will double underline some things, and then you will go home and transfer it to notebooks. I live in those notebooks. I draw technology, web, data, and production workflow to actually implement the spirit of Dan Kennedy. I’m a GKIC Independent Business Advisor (IBA) – meaning I own the Northern Virginia MD territory of Glacier Kennedy Insider Circle. We have a local monthly chapter and local mastermind group. We also have a private client mastermind group, which I call a trust mastermind. As an IBA, I have access to lot of his learning materials, and I am always buying his stuff. I have the only Dan Kennedy library in the world. You can come to my office, we can sit on a couch, pick something from the bookshelf and go through what Dan Kennedy said, and if you want a corresponding mindmap, I will print that out for you. That’s my relationship with Dan Kennedy. Who comes up with the content? Content is a touchy subject. There are experts who know how to write, but someone needs to be skilled to capture the spirit of your practice and display it in a way that only you or someone better than you can display it. You don’t want to outsource it for the sake of saving time. You want to in-source it and seek the assistance of a content concierge who will help you follow Dan Kennedy’s principles of persuasion. There are lots of books written on how to write content. Robert Cialdini wrote several books on the psychology of persuasion. Dan Kennedy wrote books and even has a formula for how to write content. You should study this material so you are in the right mindset. You can write your own copy if you feel that you are comfortable, or our copy concierge will work with you. Yes, we will have someone write for you. It is not something we do internally; we outsource it. We have other companies that we work with. I am on a private client list for Dan Kennedy. I have relationships because of my affinity with GKIC. one firm that we work with very closely, and if you need assistance, we will give you a referral. Our prices do not include copy writers because we expect the clients to provide the content. Content means copy, images that need to be purchased, and videos that need to be shot or bought. We will help you come up with what content you need, and then someone will come up with the content, but most of it will come from your heart. What if I need videos? to give them the context, and we will be happy to provide that. location, or fly you out to a studio, we can arrange that— but the cost to do anything on the video is usually not included in the price that we charge. The consultation on the things that we do to help you come up with what you need for your video, and all the other things we will be able to help you provide, that is included in the fee. A lot. Even though it is a done-for-you service, we are working on you. It is your business, so at times you will find the amount of work that you will have to do even after paying for our fees, you will find it frustrating. It is important that you understand your role and play your role well. If you don’t, what we do for you will not deliver what it is supposed to do. So all in all, you should think about how much work you think you will have to do after you hire us, and triple that. We will help you manage your workload, we will nurture you in and out the project; we have systems in place to help you do what you need to do. We have procedures, systems, and applications in place that will help you manage your workload. We will not leave you alone. We will tell you exactly what needs to be done, and someone will be there to assist you to do what you need to do, but you will have to do your share of work. There are certain things you just cannot outsource. We are. We have a dedicated project manager who will be running the project, and he will be in charge of the project management dashboard. You, your staff, and the other vendors will be reporting to this one master dashboard of the master task list. So there will be one person who is in charge of everything at Elaunchers.